Karelian Bear Dogs, or Karjalankarhukoira, are capable of hunting both large and small prey including wolf, lynx, deer, squirrel, rabbit, and martin. However, it is their fearlessness against bear, both on a hunt and as a protector for which it gets its name. They also have held secondary roles as watchdogs and property guards. The Karelian Bear Dog is nearly identical to a second breed, both from Karelia, the Russian-European Laïka. Despite their similarities, both breeds are recognized by the Fédération Cynologique Internationale. 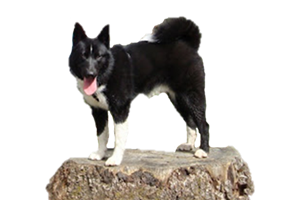 The Karelian Bear Dog’s ancestors were ancient spitz native to what is now Karelia. Karelia is divided into two countries, Finland and Russia and various times through the centuries the battle for control of the region has put this breed at risk of extinction. Early Karelian Bear Dogs had the classic black and white coat, along with reds and grays. When serious breeding began in the 1930s the other color varieties were bred out. By the 1950s the Fédération Cynologique Internationale chose to accept Russian dogs as a different breed, the Russo-European Laïka. Both dogs are still similar but have been breeding along separate lines for the better part of a century. Today the Karelian Bear Dog remains popular and is gaining attention around the world. In North America, it has been used for bear control in both the United States and Canada. Is the Karelian Bear Dog Right for You?